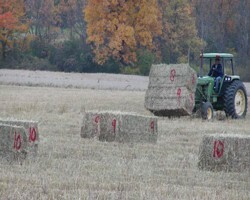 Forage yield trials are planted and harvested annually at the Cornell University Agricultural Experiment Station in Ithaca and at three other locations in New York State. Funding for these trials is provided by the companies that submit the varieties/ cultivars in the trials, from Cornell University College of Agriculture and Life Sciences, and from Northern New York Agricultural Development Program. Trials of perennial forages are managed for four years; seeding year and three production years. Alfalfa yields for 2012 averaged 5.0 tons per acre dry matter (0.4 tons less than in 2011), red clover yields averaged 2.8 tons per acre dry matter (0.5 tons per acre less than in 2011), and perennial forage grass yields averaged 4.8 tons per acre dry matter (0.8 tons per acre less than in 2011). Plant breeders continue to develop new and improved cultivars. Cultivars are continually released and were selected for improved agronomic characteristics such as yield, disease and insect resistance, forage quality, etc. Seed cost of improved cultivars can be higher than for other cultivars, but this cost is generally offset when there is improved performance at each harvest over the life of the stand. In each New York trial, there is a group of top yielding cultivars. Cultivar performance should be critically evaluated by comparing yield with other cultivars in two or more trials that are in the second or later year of production.